Home News 4D v17 R4 is here! We’re pleased to announce that 4D v17 R4 is now available! Take full advantage of your multi-core computers with: preemptive processes on the client, and Begin SQL/ End SQL command that is now preemptive-compliant. 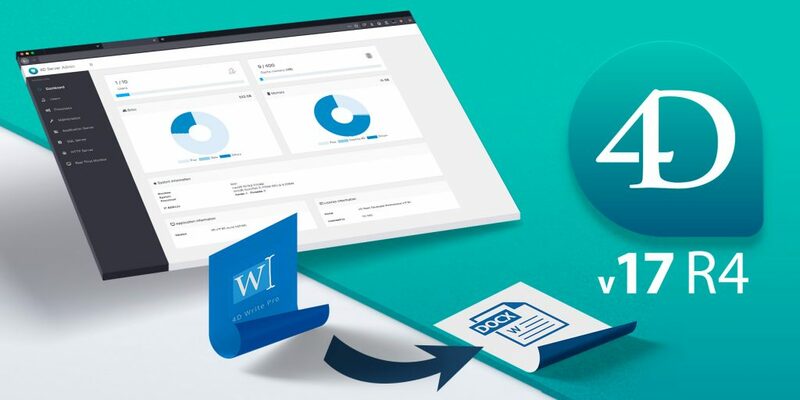 Exporting your documents in .docx format and graphically managing vertical margins thanks to a vertical ruler are just a part of the new 4D Write Pro features. Make use of restricted queries, multi-criteria search, and the ability to create custom data formatters in your 4D for iOS application. Discover the new way of sending emails in 4D. You’ll be pleasantly surprised by the simplicity and power. Explore the additional commands we’re shipping to programmatically handle your 4D View Pro documents. Download 4D v17 R4 and discover all the advances in this R-release!